In Colonial times floor coverings were a necessity, a means of covering rough-hewn floorboards and blocking the harsh winter air from seeping inside. 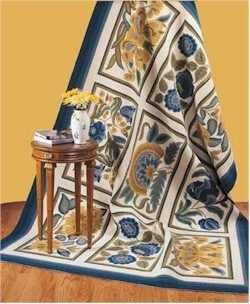 The rugs of yesteryear were made of old and outgrown clothing, cut into strips, then fashioned into long braided strands. These braids were then hand laced together to create the appropriate size area rug. Today, Thorndike Mills melds the techniques of yesteryear with modern day technology. Using only the highest quality NEW cloth material or yarn-spun fabric, Thorndike Mills creates authentic reproductions of Colonial Americana, as well as designs to compliment today’s country décor with their original design heirloom quality braided rugs. Superior Cloth Construction - T.M.I. is the only manufacturer of true cloth braids. No filler materials are used. The cloth material is guaranteed to be a commercial-color match. Yarn Construction - Our braids are filled with a new blend of pre-shrunk natural and synthetic fibers. Unknown fillers can, either in the course of use or cleaning, emit dyes bleeding to the surface or sub-floor or cause shrinkage, which could lead to improper wear or buckling. Sewing Threads - We use only shoe-grade-spun polyester with a cotton wrap. The characteristic of cotton, combined with the strength of polyester, will not unravel or breakdown over a period of time. Our sewing thread is carefully color coordinated to the color scheme of the rug and is sewn using a lock-stitch method to prevent unraveling should a stitch break. Standard and Custom Sizes - Most known standard sizes are available in all our products. Contrary to industry practice, our actual sizes are within tolerance of stated size. Unique with Thorndike is the availability of custom sizes, in either round or oval, without penalty of extended delivery dates or unreasonable costs.